"Technology pushes art and art pushes technology." I consider myself lucky that I got to experience both the death of analog world and the birth of digital. I remember playing actual records in my house as a little kid. (I was of that rare breed that listened to Yellow Submarine and The Monkees in equal measure.) Eight-tracks were before my time, but I did own a red and yellow Sony Walkman with a little window in the back that showed the actual gears turning as it played the Ghostbusters II soundtrack on cassette tape. I remember having my mind blown by the graphics on the first Nintendo console and spending what felt like an entire Christmas day watching my older cousin play Super Mario Brothers all the way to the end. But when it came to movies, VCRs and VHS tapes were just an accepted part of my reality. It was always easy to watch movies at home, but even as a child I could tell that the viewing experience just wasn't the same. In fact, I vividly remember getting into an argument with my parents about how much I wanted to see a movie (I think Neverending Story II) in the theater as opposed to waiting for it to come out on video...not because I didn't want to wait, but because "the picture doesn't look the same." VHS always felt soft and fuzzy, whereas projected film had all kinds of wonderful grain and texture that simply didn't exist in my living room. The argument over image quality is only one aspect of Side By Side, a documentary produced and hosted by Keanu Reeves that explores "the science, art and impact of digital cinema." For anyone who's ever wanted to learn more about the actual technical process of filmmaking, this doc serves as a wonderful primer. First of all, director Christopher Kenneally walks you through everything from shooting to editing to color timing to exhibition to archiving. It's a simple but effective layman's tour of an art form that millions adore but few truly understand. 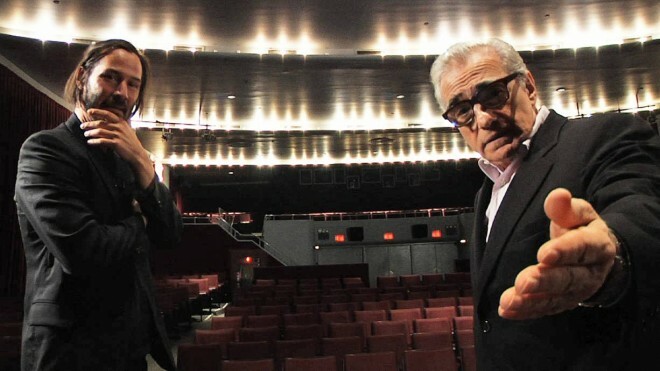 Moreover, Reeves and Kenneally have assembled a varied and auspicious collection of film talents to offer their own opinions on the perils and promise of digital filmmaking. We're talking about cinematic legends of every stripe and more Academy Award winners than I could count. Some, like Chris Nolan and Wally Pfister are die hard film devotees, while folks like Steven Soderbergh, David Lynch and Danny Boyle have fully embraced the freedoms of shooting digitally. And that's just a taste: we also see household names like Martin Scorsese, James Cameron, George Lucas, David Fincher, Richard Linklater, Robert Rodriguez, Joel Schumacher, Lars Von Trier and Andy & Lana Wachowski, as well as journeymen like Bill Pope, Anthony Dod Mantle, Vilmos Zsigmond, Michael Ballhaus, and Walter Murch. This is a documentary I would have loved to work on because I could listen to these guys talk about movies for DAYS. The impact of digital reaches into every single aspect of cinema. For instance, did you know that the production of celluloid film cameras ceased two years ago? At the same time, design and innovation of digital capture cameras is currently moving a blistering pace and there's good coverage of the plethora of highly buzzed about cameras with badass names like Genesis, Alexa and RED Epic. When it comes to theaters these days, everyone's talking about 2D vs 3D, but there's also a fascinating conversation to be had about digital vs celluloid projectors. For instance, I recently donated to the Kickstarter project for the Brattle Theater in Cambridge to help them get a new digital projector in order to continue showing older films in rep. It's a necessary acquisition as studios have become more and more reluctant to send out bulky and costly film prints as opposed to compact digital drives. (Because the Brattle is awesome, they're keeping their 35mm projector as well.) And if you've been hearing people throw around the term "4K" and want to know what the hell they're talking about, Side By Side has you covered. There are also startling implications in terms of film preservation. Since the advent of digital video there have been over 80 different formats and the majority of them are currently unplayable. (David Fincher notes that he has shelves filled with original tapes of his incredible music video work, and most of it he can't actually watch. That's depressing on so many levels.) George Lucas makes the valid point that so much of the world's information is currently stored digitally that there's simply no way that we as a society will allow these formatting issues to continue; at some point someone's going to figure out a way to maintain digital information over the long term, but until that happens celluloid remains your best bet when it comes to film archiving. You keep a celluloid print in a cool, dark space and it'll last for a hundred years. Meanwhile, I just got a crate of old VHS tapes from my parents and I haven't owned a VCR in over a decade. I think the key to this documentary is in the title. For so long the debate has been about whether or not digital can/should replace film outright. These arguments are usually centered around image quality, specifically that digital simply doesn't look the same and that film purists are so attached to that specific visual aesthetic that they'll never accept what they consider to be a substandard picture. However, as more time passes and digital cameras become more and more omnipresent, I think that issue becomes less and less important. (When it comes right down to it, the majority of audiences in your local multiplex can't really tell the difference anyway.) It's not about one replacing the other, it's about creative choice. There are movies like Avatar and Sin City that simply would not exist without the advent of digital. And it's not just effects. Digital cameras have become so much smaller and lighter that there are opportunities to physically shoot in ways that are impossible with traditional film. (28 Days Later and Che are held up as great examples of this argument.) Meanwhile there are incredible artists out there who have spent a lifetime honing their craft using the tools of celluloid, so they're going to continue working in that medium. And I wouldn't want them to change! Let Wally Pfister shoot his movies however the hell he pleases. While he comes off a bit combative in his interview, at the end of the day he knows what a camera can and can't do and I want him to have the freedom to use every tool available to him. When Peter Jackson's The Hobbit was released last year, the conversation was dominated by the presentation of 48 FPS. One reviewer (whose article I can no longer find) rightfully pointed out that everyone was treating the higher frame rate as the canvas, when really it should be considered as just another type of paintbrush. Ultimately I feel the same way about digital in general. Yes, there are gonna be studio heads who push the use of digital because it's cheaper, and Chris Nolan makes a salient point when he says that he's constantly having to justify shooting on film, while no one's being asked to justify shooting on digital. But it's really all about storytelling, and while the technology will certainly evolve and change over time to meet creative needs, it doesn't need to erase everything that came before. I see both film and digital continuing on for a long time to come, each serving the will of artists and the imagination of audiences, side by side.